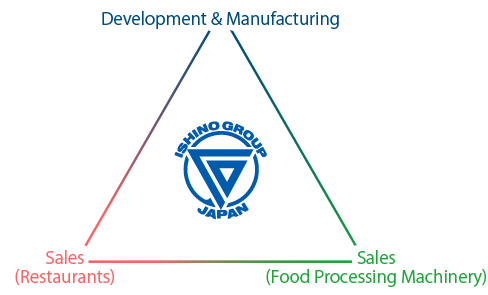 In order to provide more flexible service in fields related to food, we have established the Ishino Group. 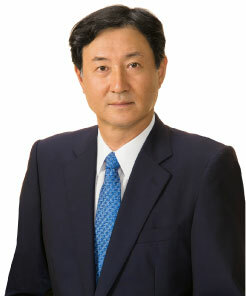 By combining the technical skill of Ishino Seisakusho with the customer support and market cultivation that Kitanihon-Kakoh and Ishino Sangyo specialize in across various fields, we can take advantage of each company’s unique skills, sharing information and knowledge among all three, for higher-quality products and services. The core company of the Ishino Group. Develops and manufactures sushi conveyor belt systems, other sushi-related equipment, baking equipment, and food processing machinery. Primarily sells and maintains sushi-related equipment manufactured by Ishino Seisakusho, as well as offering operational assistance with planning of new restaurants, managerial advice, and more. Sells products in new fields manufactured by Ishino Seisakusho, including baking equipment, as well as gathering customer needs and issues to provide information to the development team. The Ishino Group has come a long way from our modest beginnings as a small factory in 1959. The opportunity that led to our growth was our Sushi Conveyor Belt with a Hot Water System, developed in 1974. By integrating the conveyor belt and hot water dispensers into a single system, we provided revolutionary new value to sushi, a traditional part of Japan’s food culture. Since then, the conveyor belt sushi industry has rapidly developed, and diverse needs have arisen. From an early point, the Ishino Group has established a system with separate manufacturing and sales, ensuring that customers’ requests are precisely understood, and allowing us to contribute to the development of the conveyor belt sushi industry through our cutting-edge products. In addition, by utilizing our organizational strength, we have been able to develop food processing equipment targeting the broader food service industry. Our top priority is on our customers’ requests, and what types of needs arise at their restaurants. Our enthusiasm for making our products is driven by our combination of technical skill and creativity. In order to put this into practice, all three of the Ishino Group’s companies — Ishino Seisakusho, Kitanihon-Kakoh, and Ishino Sangyo — work together to offer our customers ever-better solutions, faster than ever. Food-related needs are becoming more diverse as time goes on. At the Ishino Group, our commitment to solid, honest manufacturing has been a core value ever since our founding. We look forward to continuing to use the know-how we have developed over more than half a century, taking on ambitious new challenges to create new value for our customers. Founded Kanazawa Hatsujo Shokai in Yamanoue-machi, Kanazawa City. Built a new factory at Ri-59 Masuizumi, Kanazawa, and changed the company name to Ishino Seisakusho. Established Ishino Seisakusho Co., Ltd.
Earned praise for the company’s proprietary gunny-sack retainer, available to agricultural cooperatives and federations of economic organizations throughout Japan. Began manufacturing and selling Sushi Conveyor Belts with Hot Water Systems and Dishwashers, which received utility model patents. 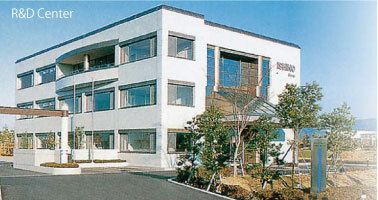 Established Daimasu Shoji Co., Ltd. as the nationwide headquarters of the Kurukuru Sushi chain. Opened its first directly-managed restaurant: Kurukuru Sushi Irie. Began manufacturing and selling selling sushi robots. The company’s first exported sushi conveyor belt was installed in Honolulu. Built a new factory in Matto City (now Hakusan City). Began manufacturing Dry Egger IDE soft-boiled-egg-making machines with far-infrared heaters. Our Hot Water System for Food Counters Equipped with Conveyors (patented product) received a Small and Medium Enterprise Agency Director-General's Award. Began manufacturing Ceramic Burner ICB continuous burning machines with far-infrared heaters. Began manufacturing IHB Hybrid Burners. Began manufacturing IGB Hybrid Burners. Built a new R&D center in Matto City (now Hakusan City). Developed our Chainless Conveyor System. Developed our Time Management System. Acquired NSF certification for sushi conveyors. Our Sushi Conveyor Belt with a Hot Water System received a Special Award Commemorating Thirty Years of Publication of Nikkei Sangyo Shimbun, at the Nikkei Superior Products and Services Awards. Developed Tokkyu Lane, a system to deliver ordered items on double-lane sushi conveyors. Our Flat Panel Sushi Conveyor received a 2005 Good Design Award. Selected by the Minister of Economy, Trade, and Industry as one of 300 of Japan's Vibrant Monozukuri (Manufacturing) SMEs Supporting the Future of Japan. 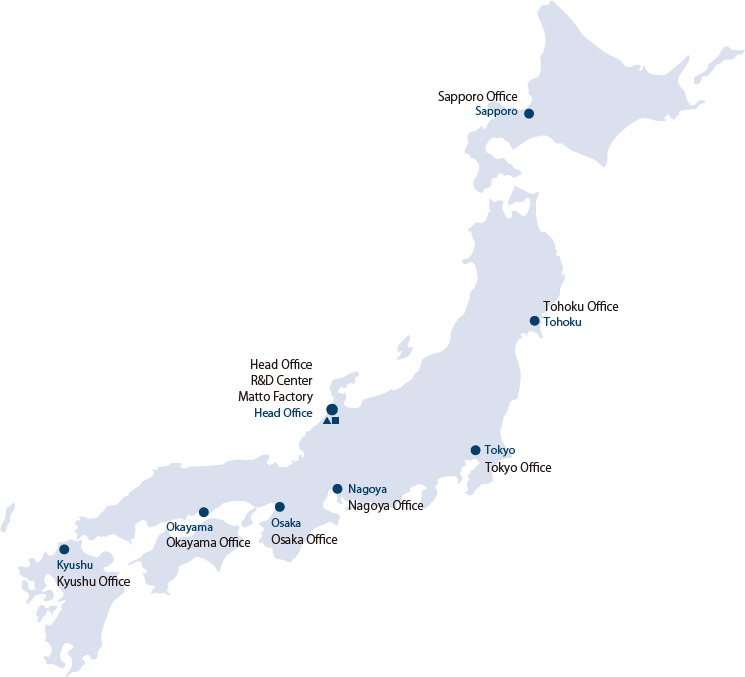 Selected by the Japan Patent Office as one of 110 Vibrant Companies in Intellectual Property. Awarded a commendation by the Commissioner of the Japan Patent Office as a Company Making Excellent Use of Design. Our gunny-sack retainer and sushi conveyor system were awarded Ishikawa Manufacturing Industrial Heritage recognition. Exhibited at the Sekai-Ichi: Unique Inspirations Made in Japan special exhibition. Developed Karu-Veyor, which was certified as an Ishikawa Brand product. Exhibited at Expo Milano 2015. Selected by the Japan Patent Office as one of 78 Small and Medium Enterprises Making Efforts with Wisdom and Intellectual Property.